The owner of this image supports the Embedded Metadata Manifesto and submitted it to this site. 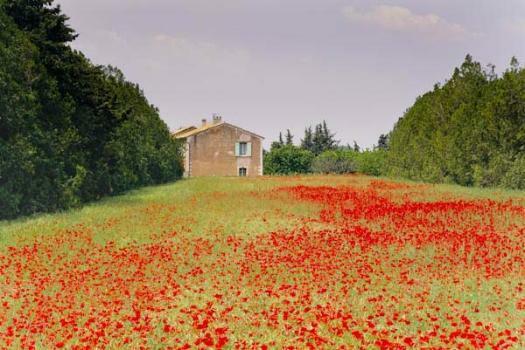 Poppies bloom throughout Provence, France in late April or early May. The Embedded Metadata Manifesto initiative recommends embedding a semantic markup of metadata values in web pages. That means that a special HTML markup is used which is invisible to the human eye but which can be read and understood by web crawlers. This special markup enables the crawlers to know exactly what the headline, the caption, the creator, the date of the creation, or the copyright owner of an image is. This page includes for the metadata fields from the headline down to the copyright notice of the image - excluding the More Metadata table - semantic web markup using the IPTC rNews/schema.org schema with the HTML 5/Microdata syntax. Support for the Embedded Metadata Manifesto may be expressed by sending a photo with embedded metadata to emm-support@iptc.org. In an automated process the metadatata will be retrieved and added to a web page which displays the image and a core set of descriptive metadata next to it - just like it is done on many web pages showing an image about a topic. Copyright 2011 Embedded Metadata Manifesto - IPTC - All rights reserved. Rights on the image above are held by the annotated party.